Incy Wincy spider went up the water spout,.., a common nursery rhyme learnt in school or at home when one is very small. What follows are plenty of words of caution about spiders, leaving a permanent memory of a spider as a villainous creature in young minds. A picture that gets reinforced as one grows. Are spiders to be feared and disliked in such a disproportionate manner? Do we stop to think of the service they quietly perform for us? We are not aware of anything about them as they are often quite invisible. Yet we spin ridiculous stories of their behaviour and actions. Thus what we know is a lot of blind beliefs passed on from one generation to another. 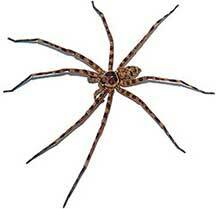 Spiders are amongst the best when it comes to pest management both inside and outside homes. There is an old English proverb that goes, “If you wish to live and thrive, let a spider run alive,” and yet spider life-histories are stories of facts mired in fiction. Many misconceptions exist about invertebrates. Amongst the many creatures that get passed off as insects, spiders head the list. Spiders and insects belong to the same Phylum Arthropoda, While the six-legged, winged insects, with their body divided into head, thorax, and abdomen belong to the Class Insecta, the eight-legged, wingless spiders, with the body divided into cephalothorax and abdomen belong to the Class Arachnida. These are not the only features that differentiate a spider from an insect, there are others, which can be an enquiry exercise for class six.